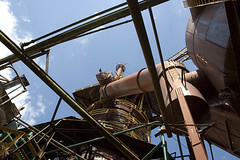 If you like to take pictures, you’ll dig the hell out of the Sloss Furnaces . 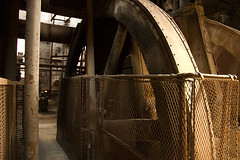 The place is loaded with great inspiration for pictures, from the interaction of nature and industry to the textures of rotting metal and weathered brick. And yet, the place is classy, accessible, and somehow clean feeling even though it’s also rife with rust and weeds. Beautiful juxtaposition there. 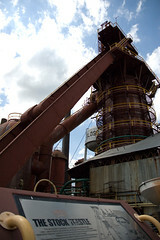 The Sloss Furnaces, located in downtown Birmingham, are about two hours from metro Atlanta and worth the drive. The place is kept as a local heirloom, but it’s not a behind-ropes sort of place. Wander around. Touch things. Take pictures. The place is just set out for you, interactive in the most elemental sense—you control your trip, you decide where to go, you find your own unique photos even in this often-photographed place. The steampunk vibe is palpable and lovely. There’s this terrific performance venue on the grounds, too, beneath a towering metal ceiling, with a sloped warehouse-style floor ending in a stage that slopes up and away from the audience—perfect for visibility and a great mix of an outdoor venue with some indoor comfort. When we were there, in the midst of an otherwise quiet Sunday, dudes were sword-fighting on stage, in front a cameraman. It was like a damn episode of Highlander in there, in a good way: industrial swordplay. First, it was kids with iron rods, letting loose with huge overhead swings and swashing blows. Their “swords” clattered off the stage, sending thudding, ringing echoes into the space. They hollered dramatically. One kid back-flipped away from a lunge. If you’d told me these kids were going to replace those rods with lightsabers, I would’ve believed you. Then, after all that, they did it again. Same moves, better timing. All this was a rehearsal of the Shakespeare at Sloss company, preparing their performance of Macbeth for this weekend. It looks like one hell of an exciting, stylized production, and they couldn’t ask for a better space for action-packed Shakespeare. If you’re game, take some of your weekend and head out to performance this weekend, May 3rd and 4th. The show’s at 3pm each day, so you can drive out and back, no problem. If you happen to catch the show, be sure to come back here and drop a review in the comments. I’m hoping to get out there, but I’ve got to work, so I may be counting on your reviews for my vicarious satisfaction.